There have been several incarnations of the Doom Patrol team in the comics, and this week we got to meet a few of their members we haven't seen on screen before! Mento first made the scene in 1964's Doom Patrol #91 (written by Arnold Drake and penciled by Bruno Premiani). Like his television counterpart, Steve Dayton was the fifth richest man in the world and used his wealth to invent his psychic helmet. He assisted the first incarnation of the Doom Patrol on many missions, mostly because of his relationship with Elasti-Girl. Arani (codename: Celsius) and Joshua Clay (codename: Tempest) first appeared in 1977's Showcase #94 (written by Paul Kupperberg and penciled and inked by Joe Staton). When Cliff Steele returned to Doom Manor after an extended absence, he was surprised to find these mysterious strangers had taken over the Doom Patrol's headquarters and formed a new team. Celsius has the powers to generate heat or cold blasts, while Tempest can shoot kinetic energy from his hands. Rhea Jones (codename: Lodestone), was first seen in 1987's Doom Patrol #3 (written by Paul Kupperberg and penciled by Joe Staton). Rhea has control over electromagnetic energy, and joined Arani’s second Doom Patrol group before falling into a coma during an alien invasion. Rhea evolved into a more powerful being while in her coma, and left Earth for life among the stars... Man, the television versions of these guys sure got the short end of the stick compared to their comic counterparts! 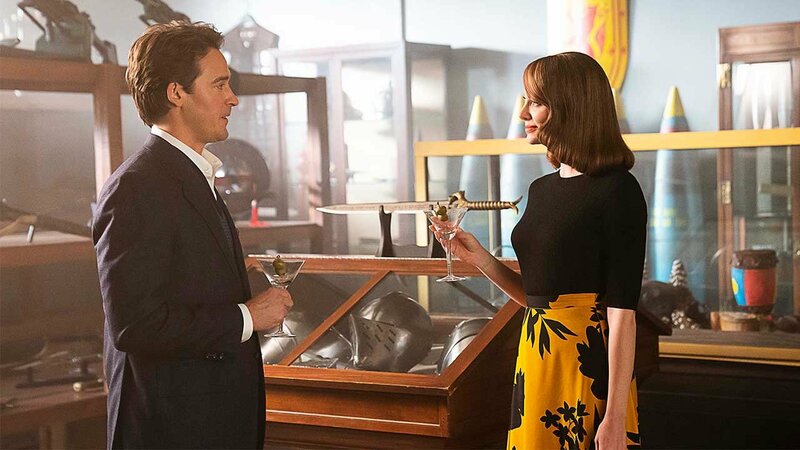 Steve may have been trying to impress Rita Farr by taking her to the Doom Patrol trophy room, but he wound up impressing us as well -- thanks to the treasure trove of comic references found within! Steve showed Rita one of the Brain’s old containment units, and it’s similar to the one George Perez designed for New Teen Titans #14 (written by Marv Wolfman and penciled by Perez). 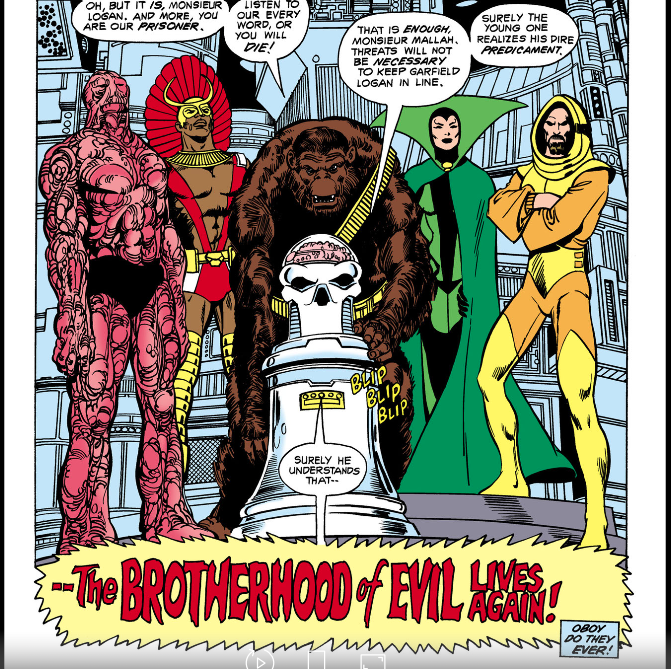 The Brain is one of the Brotherhood of Evil’s most consistent members, and he first appeared way back in 1964's Doom Patrol #86 (written by Arnold Drake and penciled by Bruno Premiani). Like Robotman, the Brain is a disembodied cerebellum that relies on machinery to keep him alive. Steve refers to him as Ultimax, which was an alias the Brain used when he controlled a giant robot body in 1966's Doom Patrol #107 (written by Arnold Drake and penciled by Bruno Premiani). The robes of Garguax can also be seen in the background. Garguax was an alien conqueror who first fought the Doom Patrol in 1964's Doom Patrol #91 (written by Drake and penciled by Premiani). 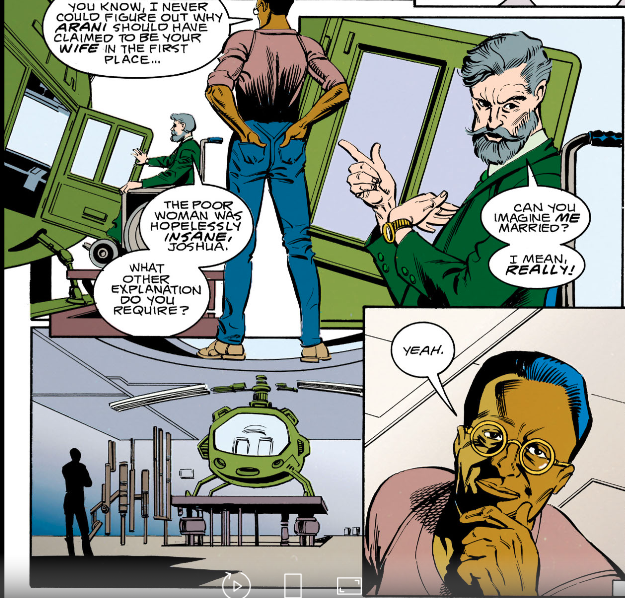 The Chief used his government connections to destroy Garguax and his ship in 1988's Doom Patrol #18 (written by Paul Kupperberg and penciled by Graham Nolan). But it looks like his robes survived the explosion... Many sharp-eyed fans also noticed Wonder Woman’s sword and shield among the artifacts! Could it be that the Doom Patrol had an Amazonian encounter as well?! Love doesn’t come easy for members of the Doom Patrol, but Rita and Steve tried their best to make things work. Rita first met Steve when he first appeared in 1964's Doom Patrol #91 (written by Arnold Drake and penciled by Bruno Premiani); and the young man was already smitten with her. In fact, part of the reason he became Mento was to win Rita’s heart, but she was afraid marriage would make her a less effective superhero. Nevertheless, Steve pursued Rita, the two became a couple, and she finally agreed to marry him in 1966's Doom Patrol #104 (written by Drake and penciled by Premiani). 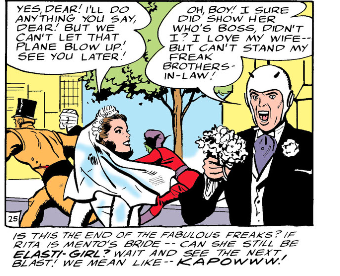 The marriage almost didn’t happen, with Rita leaving Steve at the altar during their first ceremony because she felt committed to the Doom Patrol. Luckily for Steve she changed her mind and the two were wed, but he soon realized she had no intention of becoming a traditional housewife. Despite Steve’s protests, Rita continued working with the Doom Patrol. Their marriage was further complicated when the couple decided to adopt Gar Logan, a.k.a. Beast Boy, in 1967's Doom Patrol #110 (written by Drake and penciled by Premiani). Steve and Rita had different styles of parenting, which caused some conflict for the couple in addition to Mento and Beast Boy’s uneasy relationship. Steve’s worst fears for his wife came true in 1968's Doom Patrol #121 (written by Drake and penciled by Premiani), when Rita was presumed dead in an explosion. Steve and Gar were heartbroken and did their best to carry on as a family without her. After the reality-altering events of 2005-2006's Infinite Crisis, Rita turned up alive and resumed her marriage to Steve. Sadly, as with their television counterparts, it was Mento’s mind powers that ended the couple’s relationship. In 2009's Doom Patrol #3 (written by Keith Giffen and penciled by Matthew Clark), Rita discovered that Steve had been using his helmet to manipulate her emotions for years. Feeling violated, Rita left Steve, proving that the world’s fifth richest man couldn’t buy himself some common sense. Larry and the viewers never got a straight answer from Josh on why he recognized him. 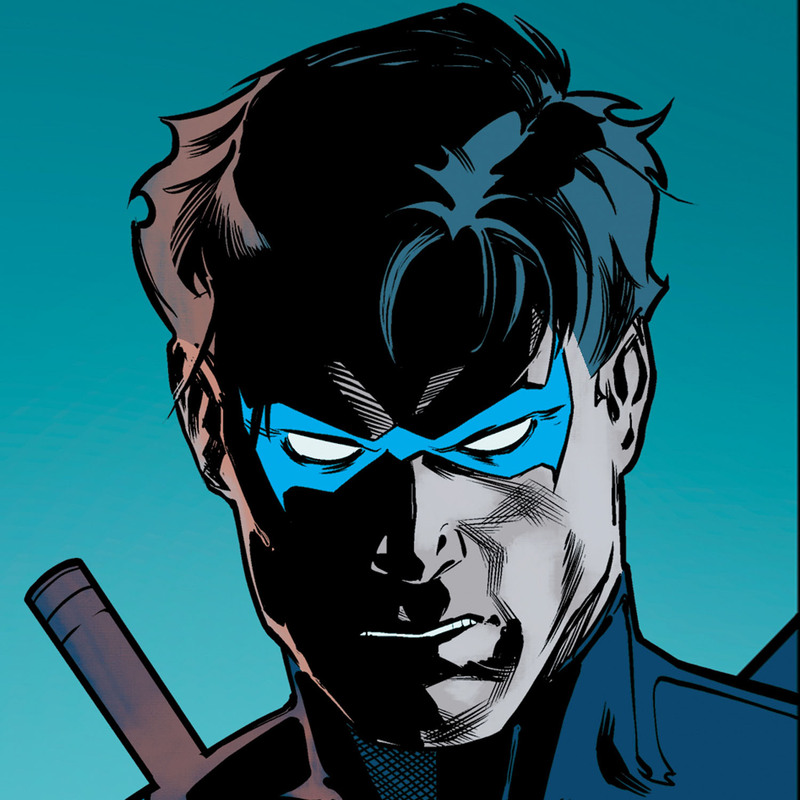 Negative Man guessed Josh was in the military, which was a piece of his backstory in the comics. 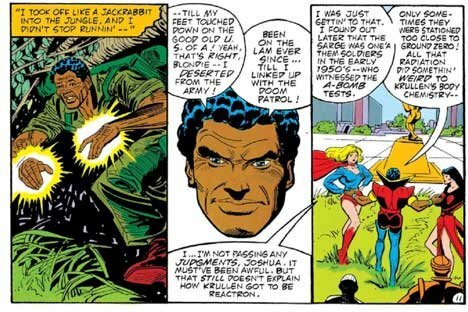 In 1983's The Daring New Adventures of Supergirl #9 (written by Paul Kupperberg and penciled by Carmine Infantino), Josh revealed that he had been stationed overseas during the Vietnam War. When his commanding officer started gunning down innocent civilians, Josh manifested his powers to defend the people. The experience shook Josh, and he fled to America, deserting the army. Is it possible the television version of Mr. Clay did something similar? Could that be why he was reluctant to answer the question about his past? Niles Caulder is a man of many secrets, but is it really possible for him to hide a wife? When Arani revealed her secret marriage to Niles in 1977's Showcase #95 (written by Paul Kupperberg and penciled by Joe Staton), Cliff was skeptical of her claims. 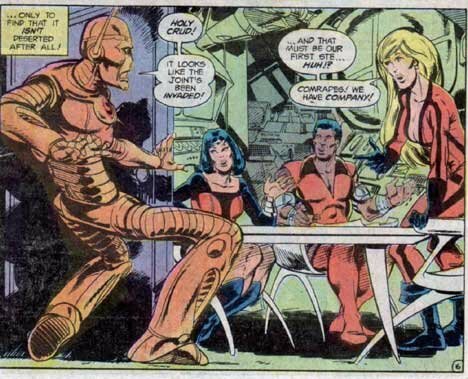 Robotman continued to press her for proof, but Arani seemed just as secretive as her alleged husband was. When Niles finally returned in 1988's Doom Patrol #16 (written by Paul Kupperberg and penciled by Graham Nolan), he denied ever being married to Arani, but she insisted he was just lying to protect her. After Arani died in battle in 1988's Doom Patrol #17 (written by Paul Kupperberg and penciled by Nolan), Niles continued to deny the marriage at her funeral and claimed she was mentally ill. The team wasn’t sure what to believe until Niles finally confessed everything to Cliff in 1992's Doom Patrol #57 (written by Grant Morrison and penciled by Richard Case). The Chief revealed that he had married Arani in order to gain her trust so he could use her as a test subject for one of his serums. Which leads one to wonder marriage was more dysfunctional -- the Chief and Arani's, or Mento and Rita's? HONORABLE MENTION: Animal-Vegetable-Mineral Man had an episode-stealing scene this week when his attempted robbery ended with him biting himself. We previously covered AVM Man in our Easter eggs for “Puppet Patrol”, but it was awfully nice to see him again. Did you catch anything we missed? Let us know in our Community!